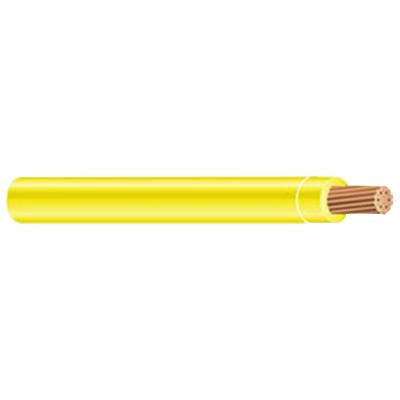 12-AWG Copper XHHW cable in yellow color, features 30-mil cross-linked polyethylene insulation and polypropylene jacket. Polyethylene insulation of this cable offers resistance against moisture, heat, flame and sunlight. Cable has voltage rating of 600-Volts and current rating of 20-Amps at 60 deg C, 20-Amps at 75 deg C, 20-Amps at 90-degree. It withstands temperature rating of 60/75/90 deg C. This 500-ft cable comes in coil. It finds application in power distribution and branch circuit wiring. Cable is UL listed and CSA certified.